Using CCBoot DHCP, Start TFTP, Start Proxy DHCP: To activate the DHCP and TFTP services for use CCBoot Clients. 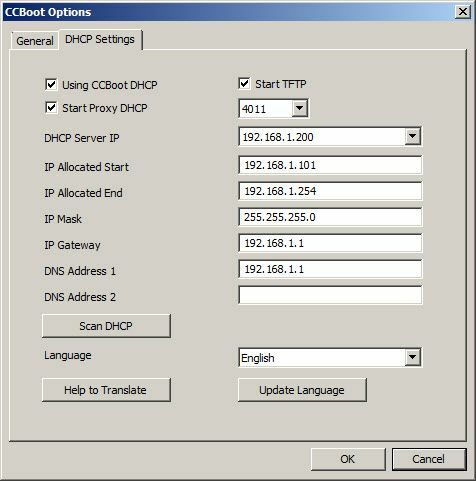 DHCP Server IP: Specifies the CCBoot Server IP address. IP Allocated Start: Specifies the starting IP address. DHCP service will allocate the client IP address from this IP address. IP Allocated End: Specifies the end IP address. DHCP service will allocate the client IP address that end to this IP address. IP Mask, Gateway, DNS Address 1, and DNS Address 2: Specifies the client IP Mask, Getway, DNS addresses. The DHCP service will automatically apply these settings to all diskless clients.If your DNS address more than three can be separated by a semicolon, write in the edit box. Scan DHCP: To Scan LAN and check if there’s other device running DHCP service. Language: To change language of CCBoot UI to selected language. Update Language: Activates the selected language. Help to Translate: Allow you to contribute to translation of CCBoot UI text in native language.